The above photograph shows the bag I made for my niece, which I made for her last birthday. I had a dress, which was made out of some lovely fabric. I kept this dress so that I could use the fabric for something else, but had never found the right project. It was my niece’s 9th birthday and I wanted to make her a nice present, so I asked my daughter for some advice. My daughter is only a couple of months younger than her cousin, they are both in the same school year and they have a similar kind of taste. It was my daughter’s idea for me to make her cousin a nice fashionable shoulder bag. We both looked through my fabric stash and we both agreed that the material from the dress was the most suitable. I have made a few bags in the last few years so I didn’t find it too difficult to make this, though I still look online for tutorials on how to put them together. I never make the same design, I just make do with what size of fabric I have. Once I had put the bag together I then added a few accessories to brighten it up. 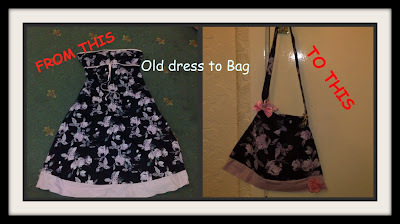 I added a few pink ribbons and pink flowers to match with the colour of the bag.